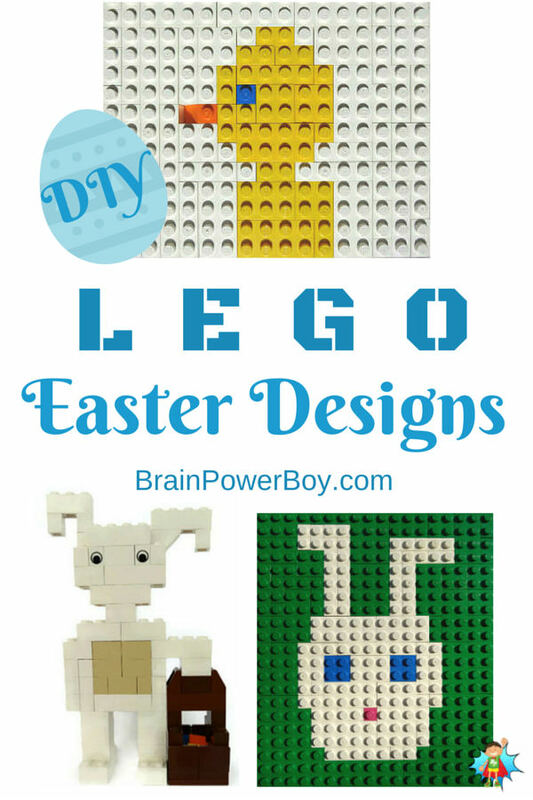 Try one, or all, of these LEGO Easter Designs for an enjoyable Easter project–LEGO style. It is getting close to Easter and that means we are thinking spring! Bunnies, chicks and Easter baskets came to mind when we decided to make a few Easter LEGO Designs for you. There are three projects for you to try. 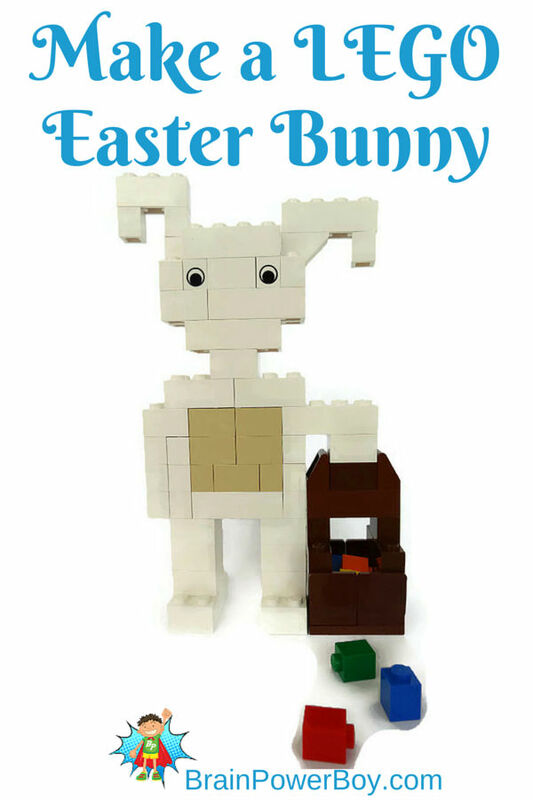 An Easter bunny with a basket and two LEGO Easter mosaic ideas. I will start with the mosaics as they are quite easy to make. The great thing about mosaics is there is a lot of graphing and counting that can be done while playing around with designs. Use our pictures and simply count across to make it the same as ours or make your own. We used a variety of brick sizes from 1×1 to 2×8 and everything in between. While we used a base plate , the green & white you see is not the base plate but is constructed of LEGO bricks so the whole build ends up being flat. The chick mosaic is 19 studs wide by 14 studs high. The background is all white bricks of various sizes. The chick is built with yellow and is 6 studs wide at the bottom and 12 studs high. Its widest part is 6 studs wide. His little beak is an orange roof tile 1×2/45° and he has a blue 1×1 eye. The Easter bunny mosaic is 19 studs wide by 22 studs high. The background is all green bricks. He is 11 studs wide at his widest part and 18 studs tall to the top of his tallest ear. His eyes are blue and his little bunny nose is a 1×1 pink stud. My son made the bunny out of standard bricks. Here are a few details to help you build your own. The directions are to start at the bottom and work up. He is mostly made of white bricks as you can see. The feet are 2×4 bricks to add some stability. The legs are three 2×2 bricks. Connecting the legs is a 2×4 brick with two 1×2 bricks next to it on both sides. The tan section is 4 studs wide and 3 bricks tall. With the bunny facing you the arm on the right is a 2×4 brick with a 2×2 brick underneath to hold the basket. The left arm is a 2×2 brick with 1×2 bricks below it. The eyes are similar to those that come from a set like this and we find them super useful when building people or animals. His head is 8 studs wide at his widest part and 4 bricks high. There is one sloped roof tile 1×2 Inv element on the right ear. The Easter basket is made of misc. pieces that we had. The image above shows all of the bricks we used. The basket is made of 4 2x2x2 seat pieces. The slanted pieces at the top of the basket are called clamp 1x2s. There is a plate under it and you can see the rest of the pieces. The basket is one plate and 5 bricks tall. The two “Ts” go on each side of the basket and the handle goes on top of them. He used 1×1 studs for the colored eggs. I thought it was a creative way to build it and I wouldn’t have thought of it myself. Oh, to be young again! You could easily use regular bricks to make a rectangular or square basket shape. We had a blast building these together and I hope you and your boys enjoy yourselves as well. I invite you to share your creations on the Brain Power Boy FB page. We would love to see what you come up with. For more LEGO projects, books, games and activities see our big LEGO page. For more Easter projects and ideas try Easter Eggs for Boys to Make, Easter Egg Drawing Challenge and Easter Basket Ideas. I love these cute Easter designs. I can’t wait to try some of them with my boys! Thanks Cindy! Hope they enjoy making them. I love this. We have so many Lego bricks, I’m sure we can make a couple of these for our Easter themed crafts! Thank you for the inspiration. You are most welcome, Marie. Have fun! Cute. Perfect theme based activity for Lego lovers. Pinning right away for my kids. Thanks Ambika–appreciate the nice comment and the pin. They were fun to find. Glad to hear your son will enjoy them–that is why I do this. 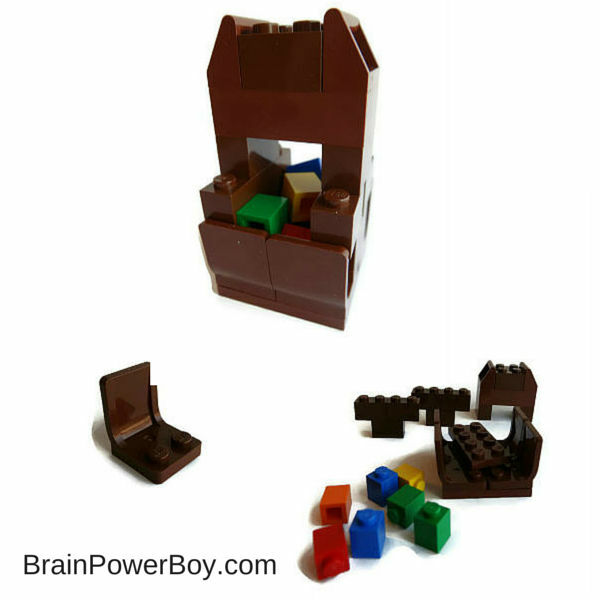 Amazing ideas and perfect for Lego-mad little ones. fun Easter Lego ideas!! Goes to show how far a little imagination can go!